The choice of heads is crucial, as they contribute hugely to the overall sound of a drum. The fact that these two new heads offer such different responses illustrates this quite clearly. Both heads performed well and brought their own qualities to the drums that they were fitted to. While a large choice of heads already exists, both of these heads have something new to offer. Being Evans, they are also superbly made. 'SST' helps deliver a "more balanced and pre-EQ'd sound across the kit"
These two new Evans tom heads were launched hot on each other's heels. The Power Center range appeared in September 2009, while an updated version of the existing EC2 head, the EC2 SST, was unveiled at NAMM 2010. Power Center heads are designed to emulate '70s tom sounds and are single-ply. This ply is in one of two thicknesses: 6" to 12" heads are 10-mil thick; 13" to 18" diameters are built around a 12-mil film. Underneath the head is a ventilated silver dot that looks like an overhead picture of a maze, is made from a metallised resin and has the look of brushed aluminium. Like the graduated thickness of the heads, the dots get progressively larger with each step up in diameter. The purpose of the dots is to dampen overtones without choking too much natural resonance. If the Power Center head is inspired by vintage sounds, the EC2 SST is very much a modern head. In common with the existing EC2, it is a twin-ply design, constructed from two 7-mil films. Underneath the head is a new edge control ring. On EC2 heads, this is made from the same metal-like compound used for the Power Center reverse dots. For the EC2 SST, Evans has developed a black material called Sound Shaping Technology (or SST for short). The SST is arranged as two rings close to the edge of each head. The space between the rings is filled with a honeycomb-like pattern made from the same SST. 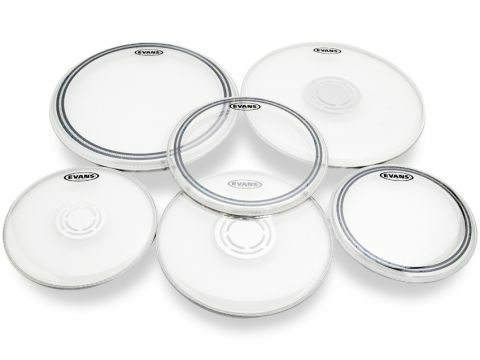 Evans reckons that the SST helps deliver a "more balanced and pre-EQ'd sound across the kit." First to be fitted were the Power Center heads. Compared to the single-ply coated heads that we'd removed, they were slightly drier but still gave generous sustain. An increase in attack was evident, as was a strengthening of the tone. Overall the toms sounded balanced with added power being met with equal warmth and resonance. Things became more focused with the EC2 SST heads. As with most twin-ply heads, initial attack was sharp while sustain was reduced. Tonally they were definitely fatter and darker. The effect of the aggressive edge and deeper sound made the toms sound both bigger and louder. While it's unlikely that they were actually physically louder, the way the heads can accentuate frequencies makes such an effect seem entirely plausible.